Something’s amiss when even the Most Conservative Think Tank in Arizona is calling on Sheriff Joe to get his act together. In Arizona Republican circles there’s no name as potent as Goldwater, as in Barry Goldwater, the longtime Arizona senator, Republican presidential nominee in 1964, a father of the modern conservative movement, and the photographer/ham radio operator who lived on a hill in Paradise Valley until his death in 1998. He’s talking about Sheriff Joe Arpaio – the “hero” of the extreme right wing, the unbeatable Republican Sheriff of Maricopa County, the guy who doesn’t seem to care what anyone thinks of him except the voters who keep electing him into office. He’s talking about today’s version of a Republican icon in Arizona, and he’s saying that the original Republican icon would be introducing his cowboy boot to the guy’s backside. I had been looking forward to breaking bread with Clint Bolick since I read his studies on Sheriff Joe. Bolick is an attorney and director of the Goldwater Institute’s Scharf-Norton Center for Constitutional Litigation. He’s only been in town a couple years, but already everyone knows he’s here. The Goldwater Institute has issued two reports on Sheriff Joe Arpaio’s office in the past year. Both of them have basically said the sheriff isn’t doing his job of law enforcement and solving crimes because he’s too busy garnering national headlines that focus on his immigration sweeps of Hispanic neighborhoods. The report sent shockwaves through the state’s political structure. The anti-immigration crowd went berserk; the rest of us let our mouths drop in astonishment. The very same words had been coming out of other mouths for months – Democrats such as former Governor Janet Napolitano, Attorney General Terry Goddard, Phoenix Mayor Phil Gordon, former state Senator Alfredo Gutierrez – but to hear them come from the Goldwater Institute was amazing. The second report, issued this May, was titled Justice Denied: The Improper Clearance of Unsolved Crimes by the Maricopa County Sheriff’s Office. In police terms, you can clear a case by either arresting the perpetrator or through “exception,” stating you’re aware of who the suspect is but special circumstances make an arrest impossible (i.e., the suspect is dead). For 80 years, the FBI has rigid rules on what it deems an “exception.” Never has it allowed an agency to claim an “exception” simply because it was too lazy to solve tough crimes. But that is the clear implication of the Goldwater Institute’s report. The report charged the sheriff’s office has fudged its “clearance” numbers for years by simply evoking the exception clause. But they went even further, demanding that the state Legislature require law enforcement groups to detail why a case was closed by exceptional means and not by arrest. It basically says, no more fudging, boys – let’s get real about real law enforcement. To say the reports have created a firestorm in far-right conservative circles – and made those in the anti-Joe camp absolutely giddy with appreciation – is an understatement. Lots of the response came by e-mail, and you get a hint of what’s coming when Bolick says, “As long as someone is civil, I respond to every e-mail.” You just know there were many that never got a response. The reaction he got made him think: Republicans are messing up if they keep attacking Hispanics as a whole. So he wrote an op-ed piece for The Arizona Republic on how the Republican Party needed to reach out to Hispanics. That was just way too much for the naysayers to handle. I listen to those words and contemplate the horror of it all, and Bolick just nods, as if to say, I wouldn’t have believed anyone could think like that either. Bolick notes that both reports weren’t just about illegal immigrants but more about how the sheriff’s office is so fixated on illegal immigration enforcement that they’re not doing their jobs in most other realms. “The reports are about their performance on law-enforcement issues, but they flunk them all,” he says. 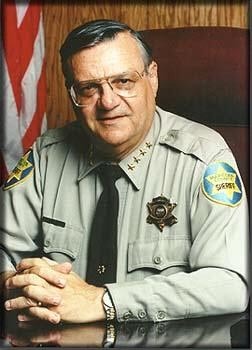 The sheriff’s office responded immediately that the Goldwater Institute had a “political agenda” in criticizing them – even declared the institute was part of the “pro-immigrant crowd.” Apparently they relied on people not knowing that this institute is the bedrock of Republicanism in Arizona, and I guess they hoped people wouldn’t connect the dots that something called the Goldwater Institute was related to the philosophy of Mr. Conservative himself. The nation did see that when reporters from the East Valley Tribune recently won a Pulitzer Prize for its investigative series on how the sheriff isn’t doing his job. Among their findings was the dismal “clearance rate” on serious crimes that led to the second Goldwater Institute report. The Tribune found in 2006 that MCSO closed three times as many cases by exception as by arrest. At that time, the sheriff’s office said it was investigating the situation. But two years later, The Arizona Republic found that only 18 percent of its 7,200 cases were cleared by arrest, “suggesting that the misuse of exceptional clearance may be unabated,” the institute reported. Bolick says he doesn’t understand what’s happened to Arpaio. Neither do I, as I wrote in a PHOENIX magazine column last year titled What Happened to Sheriff Joe Arpaio? Bolick knows that quote well and wonders why the big change – because today, the only illegals the sheriff is going after are individual workers as opposed to coyotes [human traffic smugglers] and drug leaders, he notes. While he says the sheriff’s office at one point disbanded the unit that served arrest warrants, he says they now seem to be getting back to fulfilling that crucial job. “The clearance rate by arrest, which was appallingly low, is beginning to increase,” he adds. And I’m sure that would have ticked off Barry, too.